My guess is my question is pretty easy to solve. Please help me! I’m new to Local and not very experienced with WP. I was using Local with my new theme, but I’ve done something that makes me unable to access it. The subject line shows the message I got. How do I access it again? Where do you see that error message, in the browser? If you have a screenshot of the error that would be useful to see. Let us know a little more info about this setup and we’ll have a better idea of what the next steps are to get this fixed! Thanks for replying and sorry I only got back to you now. These two screen shots might come in handy too? Thanks for those screenshots and the Local log – it helps a lot to be able to see what’s going on! 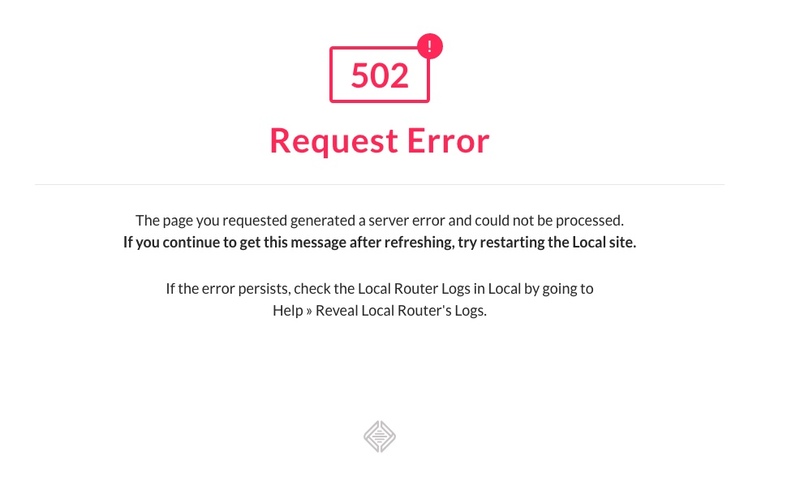 Often times a 502 error immediately after starting a site just means that Local is still “turning on” the various pieces of software. 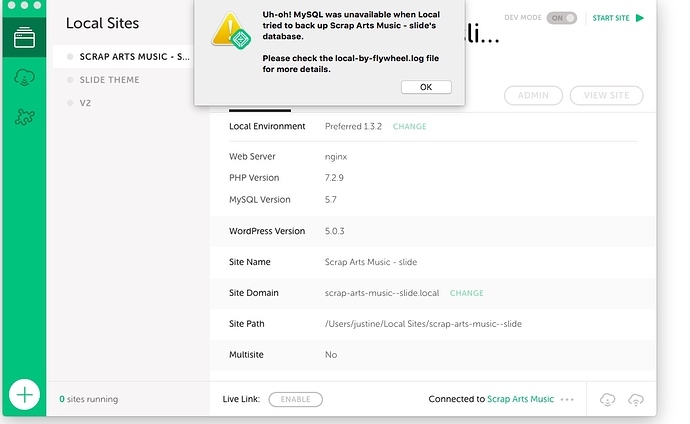 In this case, the site is still waiting for the database to become available. Usually the site should be fully loaded and all the software turned on within a minute, so the first thing to do is wait a bit and see if that resolves the 502. Are you able to turn on and access the other site? “Slide Theme” and “V2”? Are you able to create a new, blank WordPress site? 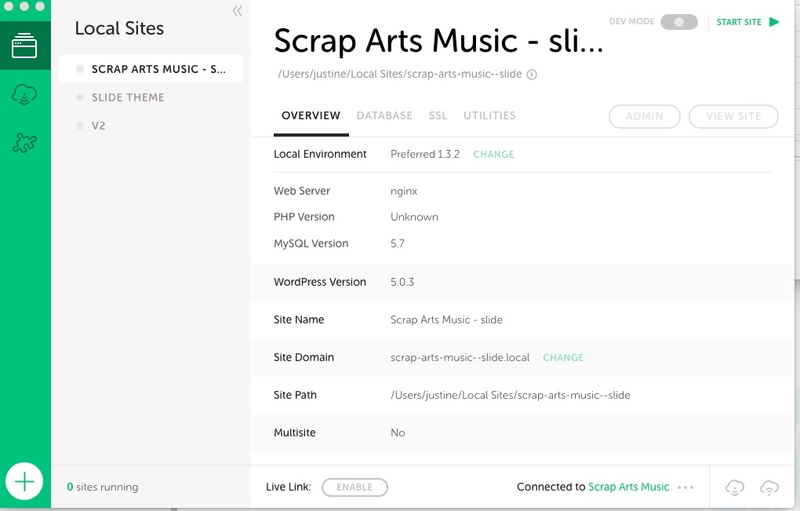 If you are able to create new sites, but are still having issues with the Scrap Arts site, can you provide a zip of the logs folder for that site along with an updated Local log? 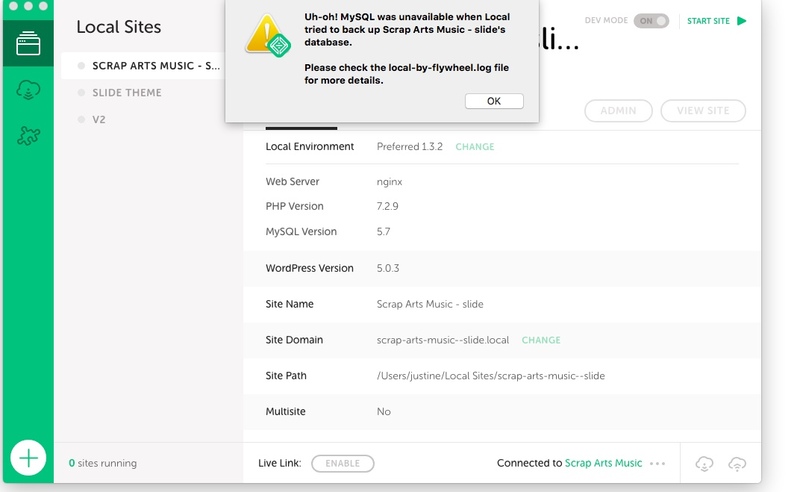 It is possible that there is something crashing MySQL, which would cause those issues, so having the site logs will be nice to review. 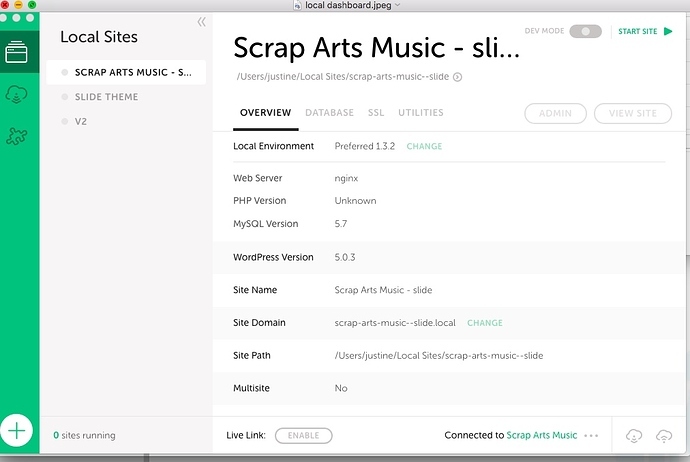 You might also try using a backup of that site to create another Local site to see if it was just a temporary fluke and having it in a new container fixes things. Please get back to me with that updated info and we’ll see what we can do next! So I should ignore the 502 and the site will eventually show up? Do I have to do something in this best case scenario? I mean, does the site spontaneously replace the 502 message? I should ignore the 502 and the site will eventually show up? Often times waiting is enough to let the site fully turn on. I would say that it shouldn’t take longer than a couple of minutes – so if you are waiting 15 mins, refreshing the browser every so often and there is still an error, then there is likely something else that is going on. This is somewhat dependent on the computer. If it’s an older computer, than it will take longer for everything to be initialized. Do I have to do something in this best case scenario? I mean, does the site spontaneously replace the 502 message? You’ll need to refresh the browser so that it tries to access the site again, but that should be all that is needed. Usually, if you’re waiting longer than a few minutes and still having issues, then there is likely something else going on. A message flashes by so quickly I can’t read it. And it magically works now. Hopefully providing these screen shots is helpful to others. Great to hear @Justine.M! Thanks for responding with what you experienced!